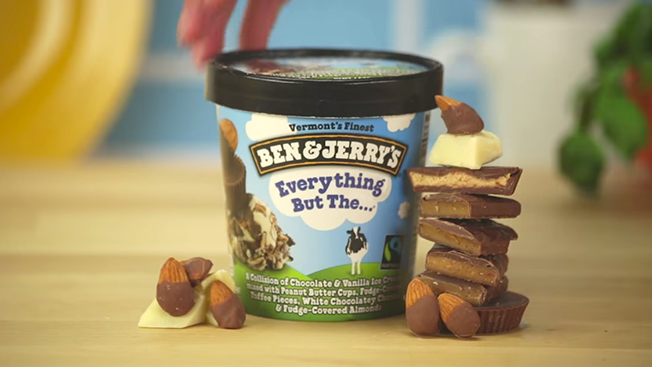 Ben & Jerry's has a fun twist to show you where its products come from. The ice cream brand grabs a spot on this week's Adweek/VidIQ top branded video chart with a short clip that uses the letters found on labels of ice cream—employing what's called the cut-up technique in art circles—to explain the brand's fair trade ingredients. The South Burlington, Vt.-based brand's video is 19 seconds long, and has been viewed 2.5 million times since it was uploaded on Dec. 30. Per VidIQ, the video included a paid media push and has also been shared on Ben & Jerry's Facebook and Twitter accounts. The video is one of four new videos that have been uploaded to the brand's YouTube account in the past two weeks to highlight its values. The other videos tout non-GMO ingredients, its involvement with Greyston Bakery (which provides jobs to low-income residents) and its work with local farms to use natural ingredients. Similar to last week, Marvel Entertainment continues to build up steam for its summer movies by teasing them via YouTube. The film studio nabbed three of this week's top videos that promote the movie Ant-Man, which is based on Marvel's classic comic book character. Kia also drums up some comic-book-related buzz this week with a video promoting its partnership with The X-Men for sponsorship of the Australian Open. Check out the full list of this week's videos below in the interactive chart, powered by VidIQ.